Encoded Designs is a relatively small game design publishing firm. Over the past few years they have launched an impressive array of products, with adventures, sourcebooks, and more, supporting games from Paranoia to Fate to D&D. Two of their recent endeavors are the adventure Halaster’s Maze of Madness and the sourcebook/monsterbook/adventure The Book of the Tarrasque (currently on sale). I review both here, and recommend them highly. Encoded Designs is a company to watch! Members of Encoded Designs include Chris Sniezak and Shawn Merwin. They are friends, and I have long had tremendous respect for what they do. I consider Shawn one of my mentors. I’m predisposed to liking what they create. That said, I believe everything I write below is accurate. Written by John Arcadian (who has written for MCG, Kobold Press, Cubicle 7, and many others), The Book of the Tarrasque covers a lot of useful ground! 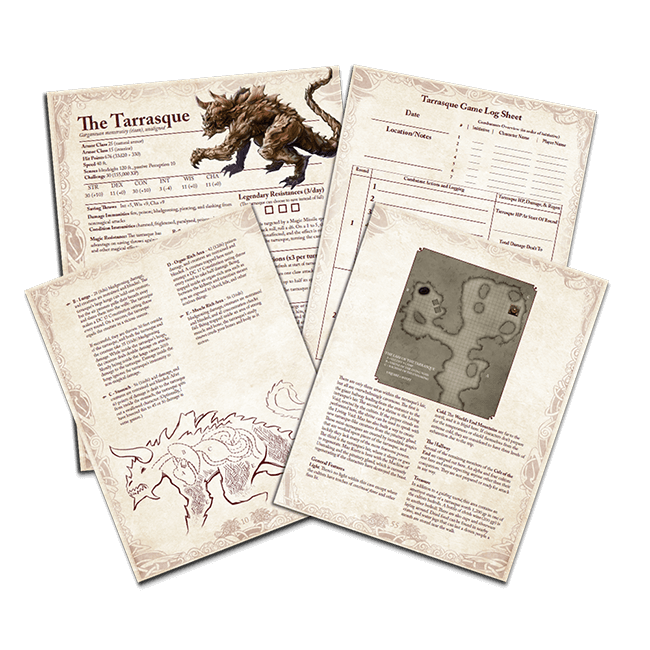 Useful extras, such as handouts for the adventure, campaign logs, statistic printouts, maps, and event the interior of the tarrasque’s body for use when it swallows adventurers and they try to escape! The book begins with Tarrasque Rules and Advice, providing a revised tarrasque and additional optional rules. Many of these speak to older editions, such as regeneration. As an example of the clever ways options are provided, the optional regeneration (minor) is tiered based on the current hit point of the monster – from no regeneration when close to full health to 40 hit points per round when below 200 hit points. You also have regeneration (major) that doubles these values, or even a constant regeneration amount of 60/round. The options come with advice, helping DMs choose the best options based on their goals for the encounter/campaign. I found this section to be extremely well written – I can only imagine the care with which this was written. A lot of creativity is found here. For example, the tarrasque swallowing creatures can be optionally supported with details for the organs within the tarrasque. A swallowed creature can crawl through the body, facing different challenges and in some cases gaining advantages when damaging the tarrasque from within that organ. The fantastically named section, The Care and Feeding of Adventurers to Your Tarrasque, provides DMs with advice for everything from one-shots to extended campaigns. 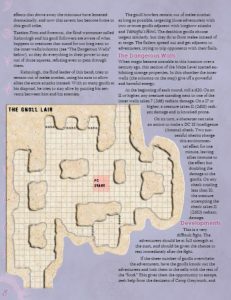 Adjudicating common issues, advantageous tactics and efficient uses of powers, dealing with party optimization and exploits, and even magic items all help the DM prepare an effective challenge. Props are discussed, including the included handouts and paper minis, use of terrain, and 3-D minis. A list of 20 plot seeds provides great ideas for DMs on why a tarrasque would appear in a campaign. Many of these are really evocative. The book then provides the adventure The Machine of Unmaking. This is a very cool adventure, ready to run, for 15-20th level PCs. Spoiler: The Cult of the End has discovered a machine that powers up as the tarrasque destroys. If the machine powers up enough (and the tarrasque is not stopped) the machine will destroy the world. The adventure has a number of options for the party, allowing them flexibility in deciding which problem should be dealt with first and whether to take time to research the foes involved. One of the many cool elements is a table that tracks the power level of the machine. As more destruction accumulates, regional effects are experienced (such as small objects becoming undone or even windows being reduced to sand). These include impacts experienced during play – at high levels the DM gets to undo parts of the terrain in an encounter and change it to create interesting challenges: the world is truly coming apart! I’m very impressed by what this product offers. There is tremendous direct utility in this product, but it is also a ton of fun just to read and mine for ideas. At $14.95, this provides the content and quality of a much more expensive sourcebook/adventure. At only $3.95, Halaster’s Maze of Madness provides an excellent delve into famed Undermountain. Written by Shawn Merwin, the adventure provides the combination of exciting interesting adventures and cool story for which he is known. Halaster, the mad mage of Undermountain, has come undone. However, his essence lives on. As a major threat prepares to escape Undermountain, the shards of his essence work to call the adventurers and prevent the escape. Undermountain’s funhouse atmosphere is brought to life in the Maze of Madness, with many encounters serving up both combat with fun monsters and a fantastic puzzle the party resolves to proceed. The puzzles are engaging and entertaining without being overly difficult or frustrating. Advice is given to help resolve these if the party needs help. One of the fun elements in the adventure is how the shards of Halaster inhabit various NPCs, changing their personalities momentarily and giving them interesting quirks and goals. The adventure includes maps for each of the encounters. These are included both within the encounter text and separately as an appendix, which I appreciate. A few maps were not labeled very clearly, though this may have just been in my review copy. The maps are interesting, and helpful whether you are describing theater of the mind or using actual minis. The adventure includes several new monsters (flind warmaster, deathkin gnoll, gnoll howlers, gnoll flailer, arcane zombie, runestone gargoyle, minotaur magus, gnome assassin, gnome arcanist). 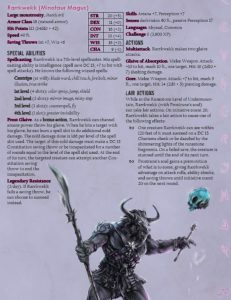 I’m usually not looking for new monsters, but these are fun and the format is clear and useful for DMs to run them effectively. The minotaur magus (show above and on the Encoded Designs website) is a good example of the quality there. Two new magic items are also provided and come with both interesting features and history. This is a strong enjoyable adventure ready to be run as-is for a memorable one-shot experience. The individual encounters (especially the Maze of Madness puzzle rooms) are memorable enough that you will also want to pull some for future use in your own home campaigns. Together, The Book of the Tarrasque and Halaster’s Maze of Madness are products demonstrating what Encoded Designs is providing for 5E and other RPGs today. I’ve previously recommended The Five Temples of the Earth Mother, but they also have products supporting FATE, Paranoia, and other systems. As a fan, I can’t wait to see what they do next! Brian Patterson continues to evolve his comic, d20Monkey. Recently, his characters explore some very difficult but important topics related to mental health and friendship. I love supporting his work, whether with his amazing world of Karthun (an excellent campaign setting and currently only $15 in pdf!!!) or through awesome and hilarious T-shirts. WizKids has provided details on the new Tomb of Annihilation board game. The excellent new WizKids Tomb of Annihilation minis set just arrived at my door and I am really impressed by the set. You can see a full gallery here. The new set of Tomb of Annihilation dice is pretty sweet. Is it as sweet as the special My Little Pony D&D dice set being offered at the Hascon convention? If you are curious about the sweet spot of HasCon pricing or want to hear about the latest games, I was a guest on episode 211 of the Going Last podcast! This entry was posted on August 6, 2017 by Alphastream and tagged 5E, Forgotten Realms, Monsters.